Scripts can be edited directly on the phone. 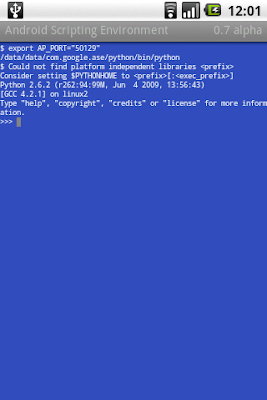 The script manager displays available scripts. Scripts can be launched interactively or as background services. Interactive terminals can be started for interpreters that support it. 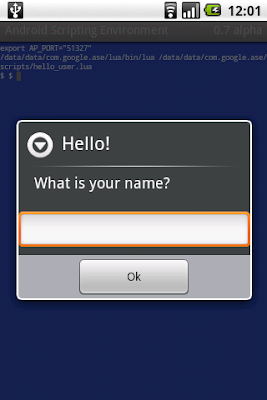 Scripts can use the Android UI to get user input. 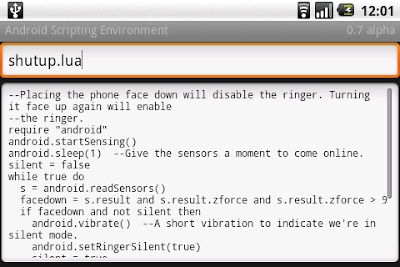 android.sleep(1)  --Give the sensors a moment to come online. android.vibrate()  --A short vibration to indicate we're in silent mode. Here's another useful script, this time in Python. """Say chat messages aloud as they are received.""" 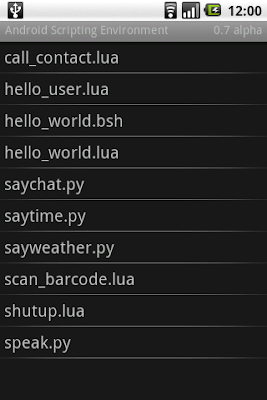 These scripts demonstrates several of the available APIs available for both Lua and Python. It is intended to be run as a service and silences the ringer when the phone is placed face down. For some scripting languages, like BeanShell, it's possible to access Android's Java API directly. To simplify things, ASE provides the AndroidFacade class. For other languages, like Python and Lua, the API is made available via JSON RPC calls to a proxy. Naturally this means that only the part of the API which has been wrapped by the AndroidFacade and AndroidProxy are available to cross-compiled interpreters like Python and Lua. Thankfully, both AndroidFacade and AndroidProxy are simple to extend. If you'd like to give ASE a try, it's not yet published to the Market, but will be soon. You can download the latest APK from our project page. Some sample scripts and documentation are also included there to help you get started. We always love to hear what you think, so please send us feedback or ask your questions in the ASE discussion group.